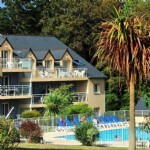 An investment property in a tourist residence with an annual income of 2,870 and a 5% return in Carantec The Gold residence is located in the heart of Brittany, in the Bay of Morlaix, close to the beach, golf courses and central Carentec. Well connected to transport services, accessible by car or by train. The residence boasts numerous features, including free wifi access, a fitness centre, two swimming pools (one indoor heated and one outdoor heated), and even a sauna. Ground floor apartment in Dinan center, street close to shops. Optimized studio offering a dining area, lounge, and sleeping zone in mezzanine. Located in the heart of the center of Lamballe a charming market town 10 mns only from the seaside resort of Val André, 3rd floor with elevator, close to all amenities, discover this pleasant apartment with nice views. It offers: entrance, toilet, bright living room / bedroom, kitchen, a bathroom and a dressing room. Also offering a storage space and a parking space. A must see quick! Pleasant 2 bedroom apartment with large balcony terrace, offering open views of Dinan area. Located on the top floor of a small building, the apartement comprises of a kitchen with a living room and dining room which opens onto the balcony, a bathroom and 2 bedrooms and a separate dressing room. This 2 bedroom apartment has been recently refurbished by the owner. The interior is light and spacious with practical and contemporary décor and layout. It is located on a duplex only 1km from the centre of Lannion. There is private, shared parking to the rear. The apartment offers a utility/entrance hall on the ground floor, a kitchen/diner on the intermediate level; a lounge, 2 good sized bedrooms and a shower room on the top level.